Mobile devices like smartphones and tablets that are used to access work email, calendar, contacts, and documents play a large role in making sure that employees get their work done anytime, from anywhere. But the growing number and variety of BYOD and corporate-owned mobile devices being used in companies today means that maintaining corporate data security is a growing challenge for IT teams. Fortunately, Microsoft solutions are available to help reduce this complexity by offering mobile device management (MDM) and mobile application management (MAM) – both on-premises and in the cloud – all from a single point of control. MDM for Office 365 lets you manage and secure mobile devices that are connected to your Office 365 organization. As a result, it’s critical that you protect your organization’s information. Securely wipe corporate data or all data from a mobile device from anywhere. Block unsupported devices from accessing Exchange email using Exchange ActiveSync. View which policies have been applied to a device and see which devices are not compliant. 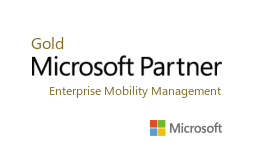 Enterprise Mobility Suite includes Microsoft Intune, which provides mobile device management, mobile application management, and PC management capabilities from the cloud. Using EMS, organizations can provide their employees with access to corporate applications, data, and resources from virtually anywhere on almost any device, while helping to keep corporate information secure. Mobile device configuration policies to manage many of the settings and features on mobile devices. Protect sensitive data when a device is lost or stolen by remotely locking the device, restoring it to factory settings, or wiping corporate data. Deploy wireless network settings to your users. By deploying these settings, you minimize the end-user effort required to connect to the corporate network. Custom polices when configuration policies don’t contain the setting you require. Lock down certain features of mobile devices like screen capture and the power switch, or restrict devices to run a single app that you specify. Create and deploy email settings to devices. This lets users access corporate email on their personal devices without any required setup on their part. Why choose Agile IT for Mobile Device Management?